Paper and paperboard packaging is an emerging trend of packaging which is gaining consumer’s attraction due to its effective solutions in food and beverages, healthcare, manufacturing, personal care and other industries. Changing lifestyle of people is playing a major role in the increasing demand of innovative and convenient packaging feature. However, rising digitalization is reducing the demand for printing, coated and uncoated papers. This is one of the key factors which may hinder the growth of paper and paperboard packaging industry in the near future. Growing demand of lightweight packaging materials, eco-friendly boxes and implementation of new innovative technology in paper and paperboard packaging industry is likely to bolster the growth of paper and paperboard packaging market. For instance, in 2014, a high-performance, lightweight eco-friendly packaging is launched by MWV Rigesa which provides effective tamper-resistance and reduces greenhouse gas emission by 10%. Moreover, development of Information and Communications Technology (ICT) and e-business into paper and paperboard packaging industry is gaining competitive advantage and the key strategy to implement the internet business technologies in US paper industry is to attract new customers. Immediate response to customers and fulfill the changing customer needs are the strategic drivers of this new technology. These innovations are expected to transform the paper industry and bring new business prospects for paper and paperboard packaging market in the near future. In 2015, over 400 million tons of paper and paperboard were produced throughout the world and is expected to increase in the near future. In the same year, China accounts for 26% of market share in global paper and paperboard production. The global paper and paperboard packaging market is projected to reach USD 321.4 billion in 2024, growing at a CAGR of 4.82% over the forecast period. Based on geography, Asia-Pacific is the dominating region for paper and paperboard packaging market in 2016, owing to the largest contribution of paper and paperboard production by China, South Korea and Japan. Asia-Pacific region is expected to hold 34% revenue share of global paper and paper packaging market in 2024. Furthermore, Latin America is expected to occupy 6% revenue share of global paper and paper packaging market by the end of 2024, due to huge paper production from Brazil and Chile. Brazil produces over 10 million tons of paper every year. Europe and North America is also projected to register robust growth for paper and paper packaging market during the forecast period. Large production of pulp paper production from countries such as Germany, Sweden, Italy and Finland are expected to contribute in the growth of Europe paper and paper packaging market. 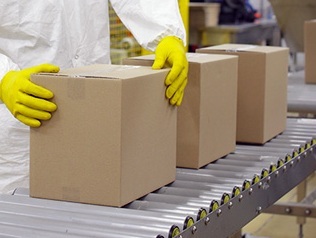 Germany is estimated to hold the largest share of Europe paper and paperboard packaging market, owing to the increasing demand for packaging in manufacturing industry. Moreover, increase paper production from Canada and US and availability of advance paper and paper package recycling infrastructure is expected to expand the paper and paper packaging market in North America region. Rising consumer awareness about non-biodegradable materials and its effect on environment, adoption of eco-friendly material has rapidly increased in the past few years. This is the major factor which is driving the growth of global paper and paperboard packaging market. Growing popularity of sustainable packaging and recyclable feature of paper and paperboard packaging are some key factors which are boosting the demand of paper and paperboard packaging. Furthermore, rising disposable income in emerging economies and growing dependency on convenient food and beverages are fuelling the demand for paper and paperboard packaging. Rising competitive environment is leading to the growth of small and medium scale manufacturers of paper and paperboard packaging. This is likely to affect the production and profit of paper and paperboard packaging and is the major restraining factor for the growth of global paper and paperboard packaging market.